The cross-presentation of Ags derived from apoptotic cell processing contributes to peripheral tolerance. Environmental signals possibly modify this default outcome, favoring cross-priming. In this study, we anchored via a biotin-avidin-biotin bridge soluble TNF-α to the membrane of apoptotic melanoma cells and studied in vivo and in vitro the interaction with Ag-presenting phagocytes. TNF-α-coated apoptotic melanoma cells injected s.c. had a faster and more efficient access to draining lymph nodes, with cross-priming of melanoma-specific CTLs and delayed outgrowth of melanomas in all treated animals. Twenty percent of the animals, in the absence of further adjuvant, did not develop the tumor. Immature dendritic cells challenged with TNF-α-coated apoptotic melanoma cells secreted proinflammatory cytokines in an autocrine/paracrine fashion, efficiently matured, as assessed functionally and by flow cytometry and cross-presented with enhanced efficiency melanoma Ags to MHC class I- and II-restricted T cells. The results indicate that TNF-α targeted to apoptotic membranes, at concentrations that can be safely reached in growing tumors without undue systemic toxicity, influences the outcome of the disposal of dying cells and enhances tumor immunogenicity. Dendritic cells (DCs) 3 are essential to restrain self-reactive T cells that have escaped negative selection in the thymus (1, 2). Indeed, DCs internalize and process dying cells in vivo under steady state conditions (3, 4, 5). The outcome of the cross-presentation of cell-associated epitopes to MHC class I- and II-restricted T lymphocytes is apparently the induction and the maintenance of peripheral tolerance (6, 7, 8, 9, 10). However, environmental signals, including the local expression of proinflammatory signals such as TNF-α (11), switch the outcome of the cross-presentation from cross-tolerance toward cross-priming. The corpses of tumor cells contain a whole array of tumor-associated Ags, and APCs that phagocytose cell corpses activate T cells (12, 13, 14, 15, 16, 17, 18, 19, 20, 21, 22, 23, 24) and initiate antineoplastic immune responses in experimental animals (21, 25, 26, 27, 28, 29, 30, 31, 32). Solid neoplasms contain, besides dying tumor cells, immature DCs, potentially capable of internalizing dying cells and activating antineoplastic immune responses (33). However, spontaneous immune responses against human cancers do not develop or abort. We reasoned that the lack of proper environmental signals could create an obstacle for the recruitment and the maturation of DCs. TNF-α, like other primary proinflammatory signals (34), favors in vivo the maturation of DCs, which migrate to draining lymph nodes. Furthermore, TNF-α at the site of in vivo clearance of dying tumor cells favors long-lasting protective immune responses, endowed with memory and specificity (28, 35). Severe systemic side effects, including capillary leak syndrome, shock, and coagulation disorders, limit the in vivo use of soluble TNF-α as an adjuvant (36). Most unwanted effects of TNF-α derive from the leakage of the cytokine from the tumor site into the systemic circulation. TNF-α also acts as a type 2 transmembrane protein. Membrane TNF-α is in most cases as active as the soluble cytokine. However, it is less involved in immune-mediated inflammatory damage in vivo (37). We reasoned that TNF-α anchored at the site of dying tumor cell clearance could prove valuable to promote cross-presentation. We therefore linked TNF-α to the membrane of dying tumor cells via a biotin-avidin-biotin bridge. Membrane-bound TNF-α indeed promotes the maturation and the function of phagocytosing DCs and molds the in vivo outcome of tumor disposal, favoring the recruitment of antineoplastic immunity. Murine rTNF-α (5 × 107 U/mg) was purified to homogeneity from Escherichia coli crude extracts by ammonium sulfate precipitation, followed by hydrophobic interaction chromatography on phenyl-Sepharose, ion exchange chromatography on DEAE-Sepharose, and gel filtration chromatography on Sephacryl-S-300 (Pharmacia-Upjohn, Uppsala, Sweden). TNF-α was biotinylated (38, 39). Biotinylated TNF-α (biotin-TNF-α) was then dialyzed extensively against saline at 4°C. The proportion of biotin-TNF-α over the total number of TNF-α molecules was estimated by affinity chromatography on avidin (monomeric)-agarose (Sigma-Aldrich, St. Louis, MO). We then detected the TNF-α Ag in the bound and unbound fraction by ELISA. The number of biotins per TNF-α subunit was measured by electrospray mass spectrometry (39). Only conjugates containing monomeric species with 0 and 1 biotin were used. The protein content was measured using a commercial protein assay kit (Pierce, Rockford, IL), and the bioactivity of each biotin-TNF-α conjugate was verified by a cytolytic assay using mouse WEHI 164, clone 13 cells (38). Bioactive TNF-α in the samples was calculated by interpolating the absorbance values on a calibration curve. The sp. act. of conjugates was 3.0–3.5 × 107 U/mg, and endotoxin content was 0.1–0.2 U/μg, as measured by the Limulus Amebocyte Lysate Pyrotest (Difco, Detroit, MI). Biotin-BSA (from Sigma-Aldrich) conjugates were also prepared (38). The H-2b B16F1 melanoma cell line, derived from a spontaneous neoplasm of C57BL/6 mice, was purchased from American Type Culture Collection (Manassas, VA). Cells were propagated in RPMI (Life Technologies, Grand Island, NY) containing 10% FCS (HyClone Laboratories, Logan, UT), 2 mM of glutamine, 100 IU/ml penicillin, and 100 μg/ml streptomycin (tissue culture medium (TCM)). Class I-restricted B3Z and class II-restricted B097-10 T cell hybridomas, which recognize epitopes between residues 257–264 and 327–339 of the OVA Ag, respectively, were grown in TCM. OVA-B16F1 cells, which express a nonsecreted truncated form of OVA that is devoid of the leader signal (residues 49–386), have been kindly provided by P. Dellabona and G. Casorati (Milano, Italy). Cell lines were routinely tested for mycoplasma infection. The nonimmortalized, growth factor-dependent immature DC line, D1, was kindly provided for these experiments by P. Castagnoli (Milano, Italy). The characterization of the line and the in vitro culture conditions have been described (40). Bone marrow DCs were derived from bone marrow precursors of C57BL/6 mice, as described (41), and cultured in the presence of murine rGM-CSF and murine rIL-4. B16F1 cells were committed to apoptosis by overnight treatment with actinomycin D (0.25 μg/ml) in TCM. Autophagocytosis was prevented treating cells with cytochalasin D (10 μg/ml), which disassembles actin-based cytoskeleton. Most cells (consistently >95%) underwent programmed cell death via apoptosis, as assessed by cytometric, morphologic, and biochemical evidences, as described (12, 42). The phase of apoptosis was determined by flow cytometry, assessing the exposure of anionic phospholipids on the outer membrane with FITC-annexin V (Bender MedSystems, Prodotti Gianni, Milano, Italy) and the ability to exclude the vital dye propidium iodide (25, 43). 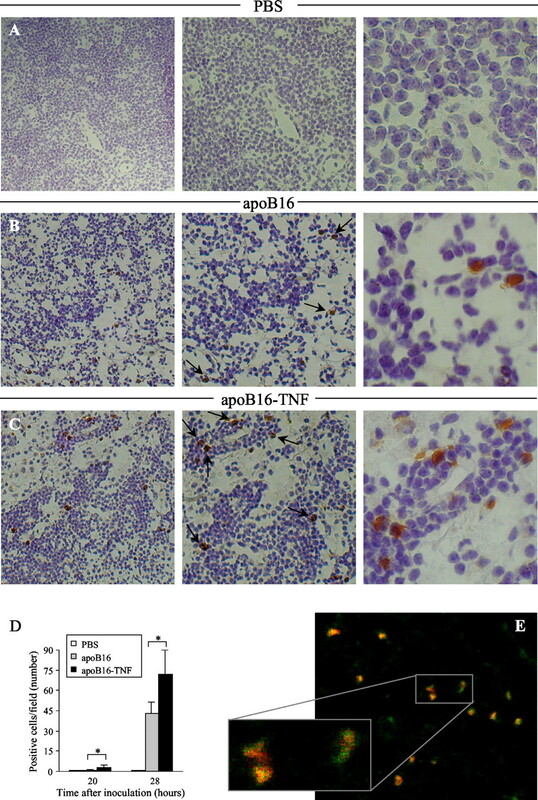 Apoptotic B16F1 cells in PBS were biotinylated before incubation with 10 μg/ml streptavidin (Biospa, Milano, Italy) in PBS containing 2% FCS (PBS/FCS) (30 min at 4°C), followed by biotin-TNF-α or when indicated biotin-BSA (5 μg/ml, 45 min at 4°C). After the final wash, targeted cells were resuspended in TCM and TNF-α on the surface revealed by flow cytometry after incubation on ice with rabbit anti-TNF-α antiserum (5 μg/ml) and goat anti-rabbit FITC (5 μg/ml). The amount of TNF-α actually bound to the apoptotic cells was also assessed in separate experiments by ELISA on the apoptotic cell lysate (44). 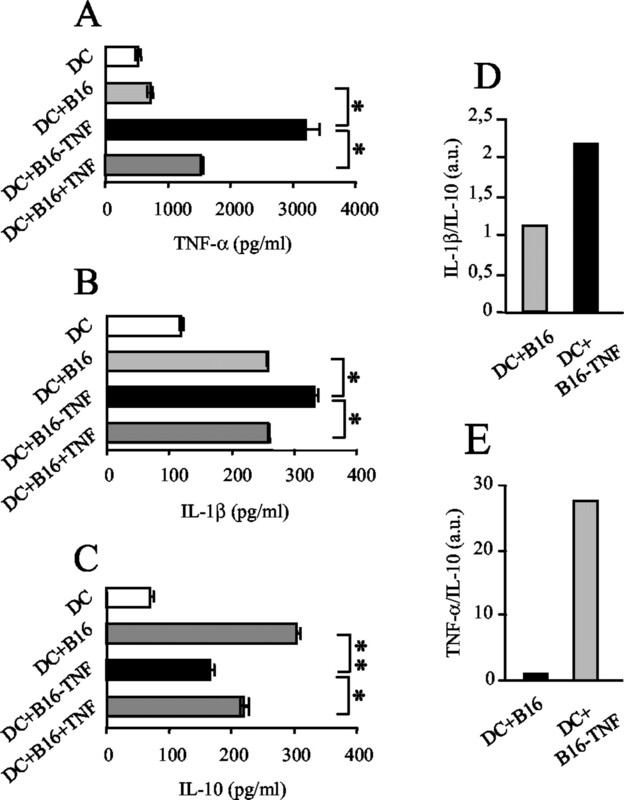 Bone marrow-derived DCs or spleen-derived D1 DCs were cocultured at a 2:1 ratio with apoptotic B16F1 cells, apoptotic B16F1 cells plus soluble TNF-α (at the same concentration of TNF-α coupled to apoptotic B16F1 cells), and TNF-α-coupled B16F1 cells. DC maturation was evaluated by flow cytometry, after staining with FITC-labeled mAbs recognizing molecules involved in T cell activation or costimulation (MHC class II, B7.1, B7.2, CD40; all from BD PharMingen, San Diego, CA), as described (15, 40). CD11c+ DCs were retrieved by magnetic bead sorting and pulsed with apoptotic B16F1 cells or TNF-α-coupled apoptotic B16F1 cells. DCs were then irradiated (3000 rad) and cocultured with 2 × 105 lymph node cells/well in TCM. Cultures were pulsed on day 4 with 1 μCi/well of [3H]thymidine (Amersham, Aylesbury, U.K.). Incorporation of [3H]thymidine was measured 18 h later with a liquid scintillation counter. Spleen-derived D1 cells or bone marrow-derived DCs were cultured with apoptotic B16F1 cells, coated or not with TNF-α, for 24 h. All medium were endotoxin free, as assayed by the Limulus amebocyte lysate test (BioWhittaker, PBI International, Milan, Italy). Supernatants were cleared by centrifugation and stored at −30°C. IL-1β, TNF-α, and IL-10 cytokine concentrations were detected by ELISA (R&D Systems, Minneapolis, MN). Mice were injected s.c. in the right flank with PBS, or with 1 × 106 of biotinylated apoptotic B16F1 cells coupled or not with TNF-α. At different times (2, 8, 20, and 28 h), draining lymph nodes were frozen in OCT. The presence of biotinylated apoptotic cells in the acetone-fixed cryosections was revealed with the Vectastain ABC kit following manufacturer indications (Vector, Burlingame, CA). Sections were counterstained with hematoxylin. For confocal laser-scanning microscopy analysis, apoptotic cells were revealed using Texas Red-conjugated streptavidin (BD PharMingen) and DC using a FITC-conjugated anti-CD11c mAb (BD PharMingen). Cells were visualized by a Leica TCS-NT (Leica Microsystems, Heidelberg, Germany), as desribed (45). A total of 5 × 104 B097-10 or B3Z hybridoma cells was incubated with a serial dilution of D1 or bone marrow-derived DCs that had been pulsed with apoptotic OVA-B16F1 cells coated or not with TNF-α. T cell activation was assessed monitoring IL-2 secretion by ELISA (R&D Systems). Mice were immunized s.c. in the footpad with PBS or with 1 × 106 of apoptotic B16F1 cells, coupled or not with TNF-α or BSA. On day 15, we boosted the mice in the right flank. On day 30, mice were sacrificed. Splenocytes were suspended at 2 × 106/ml in TCM containing 50 μM of 2-ME, 10 mM of HEPES, and 1 mM of sodium pyruvate, and coincubated with 1 × 106 mitomycin C-treated B16F1 cells. After 4 days of culture, blasts were isolated on a lympholyte-M gradient (Cedarlane, Hornby, Ontario, Canada), cultured for an additional day in medium supplemented with 20 IU/ml human rIL-2, and tested for cytolytic activity in a 4-h 51Cr release assay. Each experiment was performed using the spleen of three mice/group. Two to three animal cohorts, each consisting of five mice, were vaccinated, as described above. When indicated, mice were vaccinated with BSA-coupled apoptotic B16F1 melanoma cells, or with viable B16F1 coupled with either TNF-α or BSA. They were challenged on day 30 s.c. in the opposite flank with 1 × 104 viable B16F1 cells. Animals were then checked twice weekly for tumor growth. We scored animals as tumor positive if the mean of the two perpendicular diameters of the tumor was >2 mm and sacrificed them when the tumor reached a diameter >10 mm or ulcerated. We scored mice as tumor negative if no palpable tumor developed within 10 wk after the tumor challenge. Statistical analyses were performed using either two-tailed Student’s t test or χ2. Results were considered statistically significant for p < 0.05. Biotinylated dying melanoma cells, bearing or not TNF-α anchored on the plasma membrane, were injected in the flank of B6 mice. This site is drained by the axillary, brachial, and inguinal lymph nodes. We then checked lymph node sections for the presence of apoptotic cells at different times from the injection (Fig. 1⇓). We consistently failed to reveal biotin-labeled apoptotic cells in controlateral lymph nodes (data not shown). Apoptotic cells became detectable in the draining ipsilater lymph node after 20 h. The number of apoptotic melanoma cells steadily and significantly increased in the following hours (0.5 cell/field at 20 h vs 43.2 cells/field at 28 h, p < 0.005) (Fig. 1⇓B). These results are consistent with an efficient shuttling system, connecting peripheral tissues with draining stations. Membrane-bound TNF-α facilitated the access of apoptotic melanoma cells to draining lymph nodes (Fig. 1⇓, A–D) (71.7 cells/field vs 43.2 cells/field, p < 0.05). Also at earlier time points (20 h), the difference in the number of apoptotic melanoma cells detectable in lymph node sections was significantly higher (p < 0.05) (Fig. 1⇓D). Apoptotic melanoma cells were included in CD11c+ DCs, as shown by confocal imaging (Fig. 1⇓E). Coating of apoptotic melanoma cells with TNF-α facilitates the migration to draining lymph nodes. Draining lymph nodes were retrieved at different times from animals injected with PBS (A), apoptotic B16F1 cells (B), or TNF-α-coupled apoptotic B16F1 cells (C). Biotinylated apoptotic cells in the acetone-fixed cryosections were revealed in sections counterstained with hematoxylin. Right, central, and left columns, Report increasing magnification of selected optical fields (×10, ×20, ×80, respectively). D, Apoptotic cells per optical field in sections from lymph nodes 20 and 28 h after injection with PBS (□), apoptotic B16F1 cells (▦), or TNF-α-coupled apoptotic B16F1 cells (▪). E, Biotinylated apoptotic cells, revealed with Texas Red-conjugated streptavidin (red color), were contained into CD11c+ DCs (green color). The experiments were repeated four times with similar results. The access to draining lymph nodes of TNF-α-coated dying melanoma cells may favor the activation of tumor-specific T cells. The outcome of this event is the immune-mediated rejection of growing neoplasm. To verify whether this was the case, we evaluated whether the s.c. injection of TNF-α-coated apoptotic melanoma cells was sufficient to prevent the growth of living B16F1 melanoma. To this aim, we vaccinated animals with either apoptotic melanoma cells or TNF-α-bound apoptotic melanoma cells. As a control, mice were injected with PBS only. The treatment was repeated twice at 2-wk intervals. After 14 days, we injected 10,000 viable melanoma cells, which represent 5 times the minimal tumorigenic dose. The injection of apoptotic melanoma cells alone did not significantly interfere with the tumor growth (Fig. 2⇓A), and all animals eventually developed the tumor (Fig. 2⇓B). Immunization with TNF-α-coupled apoptotic B16F1 cells results in the recruitment of an antineoplastic response in vivo. Mice injected with PBS (triangles), apoptotic B16F1 (circles), TNF-α-coupled apoptotic B16F1 cells (squares), and BSA-coupled apoptotic B16F1 cells (diamonds) were challenged s.c. with viable B16F1 melanoma cells (see Materials and Methods). Tumor growth (A) and percentage of tumor-free animals (B) were measured at different times (x-axis). C, Reports the percentage of tumor-free animals vaccinated with PBS (triangles), living TNF-α-coupled B16F1 cells (hatched circles, B16-TNF), or living BSA-coupled B16F1 cells (hatched diamonds, B16-TNF) and then challenged s.c. with viable B16F1 melanoma cells, as above. 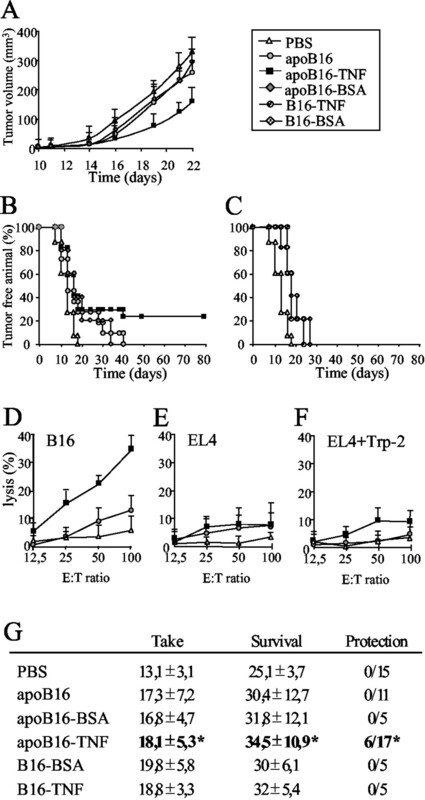 D–F, Depict the cytolytic activity of CTLs elicited in vivo against wild-type B16F1 cells (D), control unrelated EL4 cells (E), or EL4 cells pulsed with the melanoma epitope Trp-2 (F) and are expressed as percentage of specific 51Cr release at the indicated E:T ratios (mean + SD of three mice per each condition). G, Indicates the tumor take (days elapsing between the challenge with living tumor cells and the appearance of the melanoma in vivo, mean + SD), the survival (days elapsing between the challenge with living tumor cells and the death, mean + SD), and the elicited protection (number of protected animals/number of vaccinated animals) of mice vaccinated with saline, living, and apoptotic melanoma cells, alone or coupled with TNF-α or with the irrelevant protein BSA. ∗, p < 0.0025, significantly different from control. Tumor growth was delayed in 80% of the mice injected with TNF-α-coated apoptotic melanoma cells (Fig. 2⇑A), while the remaining 20% of treated animals did not develop melanoma (Fig. 2⇑B). The injection of apoptotic melanoma cells per se either untreated or coated with the irrelevant Ag BSA recruited, in the absence of TNF-α, only a waning response, insufficient to cope with the growth of the tumor (Fig. 2⇑, B and G). In contrast, we failed to detect any effect in animals immunized with living melanoma cells, coupled with TNF-α or BSA (Fig. 2⇑, C and G). Apoptosis induction and physical docking of minute amounts of TNF-α to the plasma membrane were therefore both necessary to transform the treatment in an effective vaccination procedure. This result was statistically significant (p < 0.0025). Mice injected with TNF-α-coupled apoptotic melanoma cells developed an efficient cytotoxic T cell response, while apoptotic melanoma cells alone failed to induce a detectable cytotoxic activity (Fig. 2⇑D): the CTL activity elicited by apoptotic melanoma cells in the presence or in the absence of membrane-bound TNF-α was statistically significant (p < 0.005). The response was specific, because unrelated EL4 tumor cells were not killed (Fig. 2⇑E). Furthermore, only a limited lysis was observed when target cells were loaded with the TRP2 SVYDFFVWL synthetic sequence, which represents a tyrosinase-associated Ag for the B16F1 melanoma (Fig. 2⇑F) (46). The maturation state of DCs determines whether the outcome of the cross-presentation of Ags contained into dying cells is tolerance or immunity (for a review, see Ref.2). We therefore verified whether the availability of membrane-bound TNF-α influenced the ability of phagocytosing DCs, which express TNF-α receptors, to mature and cross-present epitopes derived from the processing of internalized apoptotic cells in association with both MHC class I and II molecules. DCs challenged with TNF-α-coupled apoptotic cells matured as efficiently as DCs challenged with high doses of the soluble cytokine, as evaluated by flow cytometry (Fig. 3⇓A). DCs challenged with low numbers of early apoptotic melanoma cells (2:1 ratio) did not mature. The addition of soluble TNF-α, at concentrations mimicking those docked to dying melanoma cells, also failed to commit DC to maturation (data not shown). We obtained consistent results using either DCs derived from bone marrow precursors of syngeneic mice, cultured in the presence of GM-CSF and IL-4, or nonimmortalized, growth factor-dependent spleen-derived D1 DCs (data not shown). Functional assessment in allogeneic MLR confirmed the induction of DC maturation (Fig. 3⇓B). Membrane-anchored TNF-α promotes the maturation of DCs. 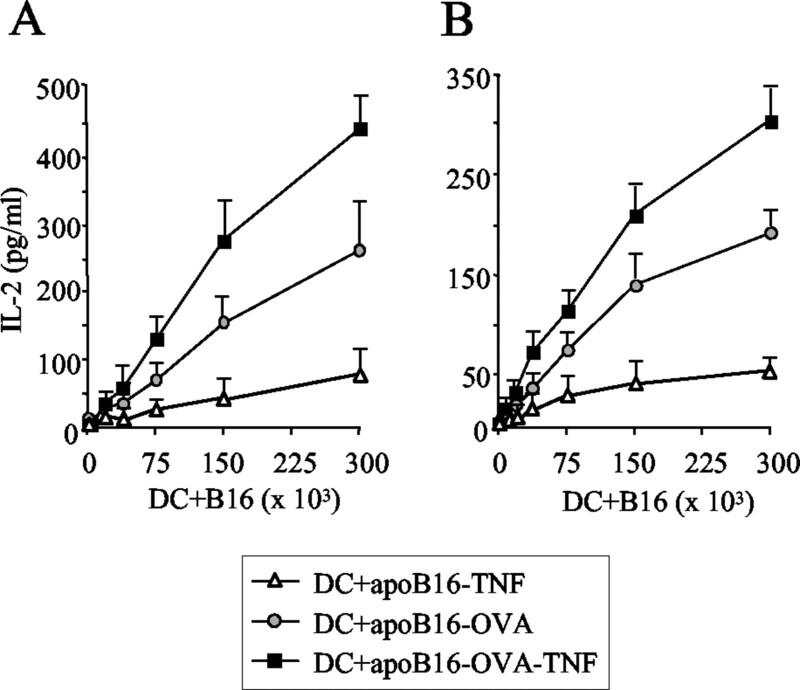 DCs were challenged for 36 h with apoptotic B16F1 cells, apoptotic B16F1 cells plus soluble TNF-α (either 35 or 250 U/ml), or TNF-α-coupled-apoptotic B16F1 cells (the actual concentration of TNF-α linked to the apoptotic B16F1 cells is equal to 35 U/ml). 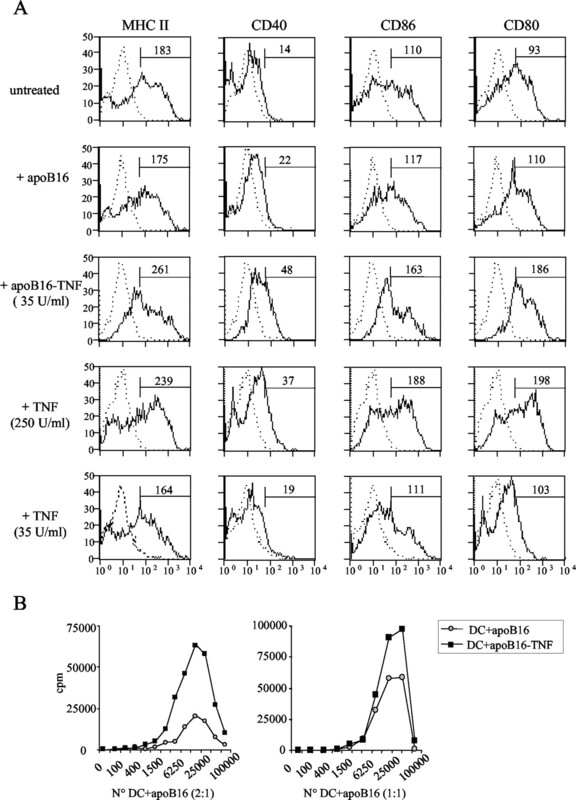 DC maturation was assessed by flow cytometry evaluating the level of expression of MHC class II, CD40, CD86, and CD80 (A), and evaluating the ability to activate alloreactive T cells in MLRs (B), using either a 2:1 (left panel) or a 1:1 (right panel) ratio between DCs and apoptotic B16F1 cells, coupled or not with TNF-α. Data shown are representative of four independent experiments. The cytokine environment determines the outcome of the interaction between phagocytosing DCs and dying tumor cells, in vitro and in vivo (15, 24, 25, 28, 47). Immature DCs challenged with low number of early apoptotic cells failed to release TNF-α (Fig. 4⇓A). In contrast, they released IL-10 (Fig. 4⇓C), a cytokine that has been implicated in the immunosuppressive clearance of apoptotic cells (48). We observed that immature DCs challenged with TNF-α-coupled apoptotic cells released significantly higher amounts of IL-1β and soluble TNF-α (IL-1β, 332.1 vs 257.5 pg/ml, p < 0.05; TNF-α, 3213 vs 720.3 pg/ml, p < 0.05). Concurrently, they released significantly less IL-10 (166 vs 306 pg/ml, p < 0.01) (Fig. 4⇓, A and E). The anchorage of TNF-α skews the secretion of soluble factors by phagocytosing DCs. We retrieved the supernatants of bone marrow-derived DCs challenged (ratio 1:1) for 24 h with apoptotic B16F1 cells (▦) or TNF-α-coupled-apoptotic B16F1 cells (▪) and assessed by ELISA the release of TNF-α (A), IL-1β (B), and IL-10 (C). □, Indicate the cytokines released by DCs alone. The experiments were repeated three times with similar results. The differences between cytokines released by DCs challenged with apoptotic cells or with TNF-α-coupled apoptotic cells were statistically significant. ∗, p < 0.05; ∗∗, p < 0.01. D, Reports the ratio between IL-1β and IL-10. E, Reports the ratio between TNF-α and IL-10. We finally verified the ability of immature DCs to process internalized apoptotic melanoma cells and to cross-present derived epitopes in association with MHC class I and II molecules. To this aim, we committed to apoptosis B16F1 melanoma cells expressing a nonsecreted mutant of the nominal Ag OVA, devoid of the putative secretory sequence (OVA). We then coated or not with TNF-α the apoptotic OVA-B16F1 and allowed immature DCs to phagocytose them. We finally verified the activation of MHC class I- and II-restricted T cell hybridomas specific for OVA. Fig. 5⇓ shows that DCs that internalized TNF-α-coated apoptotic OVA-B16F1 cells consistently cross-presented OVA Ags with higher efficiency to both class I- and II-restricted OVA-specific T cells. Phagocytosing DCs preferentially cross-present TNF-α-coupled apoptotic cell Ags. D1 cells or DCs were challenged with apoptotic melanoma B16F1 cells expressing OVA (squares), TNF-α-coupled apoptotic melanoma B16F1 cells expressing OVA (circles), or TNF-α-coupled apoptotic B16F1 cells (triangles), retrieved by CD11c+ sorting and used to activate class I (A)- and class II (B)-restricted T hybridoma cells. We assessed T cell activation by measuring IL-2 secretion (y-axis). Data shown are representative of three independent experiments. TNF-α exerts a variety of effects that can be exploited for antineoplastic therapies. In particular, it increases tumor immunogenicity (28, 35, 49). Severe systemic toxicity limits the usage of TNF-α in neoplastic patients. We decided to develop strategies to target the cytokine at the site in which DCs acquire tumor Ags. To this aim, we used the B16F1 melanoma, a nonimmunogenic, highly tumorigenic tumor. Dead tumor cells contain an unbiased array of tumor Ags and represent a suitable substrate for antineoplastic vaccination (26, 33). DCs efficiently process cell corpses and present their Ags to T lymphocytes (14, 50) and are a promising tool for antineoplastic immunotherapy (51). However, in steady state conditions, the default outcome of cross-presentation by DCs is the induction of tolerance (2, 8, 9, 52). We hypothesized that the delivery of maturation signals at the interface between DC and dying tumor cells could switch the response toward active cross-priming of autoreactive T cells that escaped thymic deletion. We targeted TNF-α on the membrane of B16F1 melanoma cells dying by apoptosis, relying on a biotin-avidin-biotin bridge (38, 39, 52, 53). Coupling of TNF-α to plasma membranes possibly favors the formation of ligand-receptor complexes of greater stability, qualitatively different from the transient interaction of the soluble cytokine with its receptors. Phagocytes that express functional TNF-α receptors, including DCs, physiologically recognize and internalize apoptotic cells (54). However, during the normal clearance of dying cells, TNF-α is not expressed. In our system, the selective engagement of TNF-α receptors exerts a dominant effect, preventing the local release of immunosuppressive cytokines (24, 48, 55, 56) and favoring the maturation of DCs. Other approaches have been recently described to enhance the Ag-presenting function of phagocytes challenged with apoptotic tumor cells. CD40 ligand has been shown to efficiently promote Ag presentation by DCs phagocytosing apoptotic cells (23). Similar results were obtained by addition of soluble TNF-α and other proinflammatory signals (23, 24). Furthermore, DCs injected intratumor exerted an antineoplastic action (28), and injection of soluble TNF-α in situ and of IL-2 systemically enhanced and maintained this effect (28). Severe side effects limit the possibility to inject soluble TNF-α in neoplastic patients, even when it is used in isolated perfusion (57). Biotechnological approaches are now available that allow targeting of molecules, and even whole cells, at the tumor site. The three-step targeting approach we used in this study was already successful in targeting TNF-α in situ, considerably improving its therapeutic index. TNF-α targeted to the membrane of dying melanoma cells influenced the clearance of the corpses, both skewing the array of cytokines released in the environment and committing phagocytosing DCs to maturation. The latter event resulted in enhanced cross-presentation of processed Ags in association with MHC class I and II molecules. Uptake by Ag-presenting DCs, maturation, and cross-presentation of internalized exogenous Ags are limiting steps for the initiation of productive T cell-dependent immune responses (58, 59). Accordingly, we found that TNF-α-targeted dying melanoma cells, once injected in vivo, promoted the productive activation of melanoma-specific CTLs and the initiation of antineoplastic responses. The in vivo targeting of tumors with TNF-α significantly increases the amount and the persistence of the cytokine at the tumor site (38), and is sufficient to increase the therapeutic index of the cytokine by at least 5-fold (52). The complementation of this approach with the intratumor delivery of APCs (35) could represent a realistic possibility for immunotherapy of human cancer (28, 60). We thank Luciano Adorini for T cell hybridomas, Paola Castagnoli for D1 cells, members of the Cancer Immunotherapy and Gene Therapy Program for discussions, and in particular Paolo Dellabona for the OVA-B16F1 cells and Matteo Bellone for reading the manuscript. ↵1 This work was supported by the Associazione Italiana per la Ricerca sul Cancro, the Fondazione Berlucchi, the Ministero della Salute, and the European Community (APOCLEAR project). V.S.Z. is a fellow of the European Community (Marie Curie Program QLK2-CT1999-51532). A.B. was a fellow of Fondazione Italiana Ricerce sul Cancro. ↵3 Abbreviations used in this paper: DC, dendritic cell; TCM, tissue culture medium. Steinman, R. M., M. C. Nussenzweig. 2002. Inaugural article: avoiding horror autotoxicus: the importance of dendritic cells in peripheral T cell tolerance. Proc. Natl. Acad. Sci. USA 99:351. Mougneau, E., S. Hugues, N. Glaichenhaus. 2002. Antigen presentation by dendritic cells in vivo. J. Exp. Med. 196:1013. Iyoda, T., S. Shimoyama, K. Liu, Y. Omatsu, Y. Akiyama, Y. Maeda, K. Takahara, R. M. Steinman, K. Inaba. 2002. The CD8+ dendritic cell subset selectively endocytoses dying cells in culture and in vivo. J. Exp. Med. 195:1289. Ferguson, T. A., J. Herndon, B. Elzey, T. S. Griffith, S. Schoenberger, D. R. Green. 2002. Uptake of apoptotic antigen-coupled cells by lymphoid dendritic cells and cross-priming of CD8+ T cells produce active immune unresponsiveness. J. Immunol. 168:5589. Scheinecker, C., R. McHugh, E. M. Shevach, R. N. Germain. 2002. Constitutive presentation of a natural tissue autoantigen exclusively by dendritic cells in the draining lymph node. J. Exp. Med. 196:1079. Green, E. A., E. E. Eynon, R. A. Flavell. 1998. Local expression of TNFα in neonatal NOD mice promotes diabetes by enhancing presentation of islet antigens. Immunity 9:733. Inaba, K., S. Turley, F. Yamaide, T. Iyoda, K. Mahnke, M. Inaba, M. Pack, M. Subklewe, B. Sauter, D. Sheff, et al 1998. Efficient presentation of phagocytosed cellular fragments on the major histocompatibility complex class II products of dendritic cells. J. Exp. Med. 188:2163. Rovere, P., C. Vallinoto, A. Bondanza, M. C. Crosti, M. Rescigno, P. Ricciardi-Castagnoli, C. Rugarli, A. A. Manfredi. 1998. Bystander apoptosis triggers dendritic cell maturation and antigen-presenting function. J. Immunol. 161:4467. Bonnotte, B., N. Favre, M. Moutet, A. Fromentin, E. Solary, M. Martin, F. Martin. 2000. Role of tumor cell apoptosis in tumor antigen migration to the draining lymph nodes. J. Immunol. 164:1995. Jenne, L., J. F. Arrighi, H. Jonuleit, J. H. Saurat, C. Hauser. 2000. Dendritic cells containing apoptotic melanoma cells prime human CD8+ T cells for efficient tumor cell lysis. Cancer Res. 60:4446. Nouri-Shirazi, M., J. Banchereau, D. Bell, S. Burkeholder, E. T. Kraus, J. Davoust, K. A. Palucka. 2000. Dendritic cells capture killed tumor cells and present their antigens to elicit tumor-specific immune responses. J. Immunol. 165:3797. Gough, M. J., A. A. Melcher, A. Ahmed, M. R. Crittenden, D. S. Riddle, E. Linardakis, A. N. Ruchatz, L. M. Emiliusen, R. G. Vile. 2001. Macrophages orchestrate the immune response to tumor cell death. Cancer Res. 61:7240. Motta, I., F. Andre, A. Lim, J. Tartaglia, W. I. Cox, L. Zitvogel, E. Angevin, P. Kourilsky. 2001. Cross-presentation by dendritic cells of tumor antigen expressed in apoptotic recombinant canarypox virus-infected dendritic cells. J. Immunol. 167:1795. Hoffmann, T. K., N. Meidenbauer, J. Muller-Berghaus, W. J. Storkus, T. L. Whiteside. 2001. Proinflammatory cytokines and CD40 ligand enhance cross-presentation and cross-priming capability of human dendritic cells internalizing apoptotic cancer cells. J. Immunother. 24:162. Pietra, G., R. Mortarini, G. Parmiani, A. Anichini. 2001. Phases of apoptosis of melanoma cells, but not of normal melanocytes, differently affect maturation of myeloid dendritic cells. Cancer Res. 61:8218. Ronchetti, A., P. Rovere, G. Iezzi, G. Galati, S. Heltai, M. P. Protti, M. P. Garancini, A. A. Manfredi, C. Rugarli, M. Bellone. 1999. Immunogenicity of apoptotic cells in vivo: role of antigen load, antigen-presenting cells, and cytokines. J. Immunol. 163:130. Henry, F., O. Boisteau, L. Bretaudeau, B. Lieubeau, K. Meflah, M. Gregoire. 1999. Antigen-presenting cells that phagocytose apoptotic tumor-derived cells are potent tumor vaccines. Cancer Res. 59:3329. Paczesny, S., S. Beranger, J. L. Salzmann, D. Klatzmann, B. M. Colombo. 2001. Protection of mice against leukemia after vaccination with bone marrow-derived dendritic cells loaded with apoptotic leukemia cells. Cancer Res. 61:2386. Candido, K. A., K. Shimizu, J. C. McLaughlin, R. Kunkel, J. A. Fuller, B. G. Redman, E. K. Thomas, B. J. Nickoloff, J. J. Mule. 2001. Local administration of dendritic cells inhibits established breast tumor growth: implications for apoptosis-inducing agents. Cancer Res. 61:228. Chen, Z., T. Moyana, A. Saxena, R. Warrington, Z. Jia, J. Xiang. 2001. Efficient antitumor immunity derived from maturation of dendritic cells that had phagocytosed apoptotic/necrotic tumor cells. Int. J. Cancer 93:539. Feng, H., Y. Zeng, L. Whitesell, E. Katsanis. 2001. Stressed apoptotic tumor cells express heat shock proteins and elicit tumor-specific immunity. Blood 97:3505. Masse, D., C. Voisine, F. Henry, S. Cordel, I. Barbieux, R. Josien, K. Meflah, M. Gregoire, B. Lieubeau. 2002. Increased vaccination efficiency with apoptotic cells by silica-induced, dendritic-like cells. Cancer Res. 62:1050. Roake, J. A., A. S. Rao, P. J. Morris, C. P. Larsen, D. F. Hankins, J. M. Austyn. 1995. Dendritic cell loss from nonlymphoid tissues after systemic administration of lipopolysaccharide, tumor necrosis factor, and interleukin 1. J. Exp. Med. 181:2237. Kianmanesh, A., N. R. Hackett, J. M. Lee, T. Kikuchi, R. J. Korst, R. G. Crystal. 2001. Intratumoral administration of low doses of an adenovirus vector encoding tumor necrosis factor α together with naive dendritic cells elicits significant suppression of tumor growth without toxicity. Hum. Gene Ther. 12:2035. Ksontini, R., S. L. MacKay, L. L. Moldawer. 1998. Revisiting the role of tumor necrosis factor α and the response to surgical injury and inflammation. Arch. Surg. 133:558. Ruuls, S. R., R. M. Hoek, V. N. Ngo, T. McNeil, L. A. Lucian, M. J. Janatpour, H. Korner, H. Scheerens, E. M. Hessel, J. G. Cyster, et al 2001. Membrane-bound TNF supports secondary lymphoid organ structure but is subservient to secreted TNF in driving autoimmune inflammation. Immunity 15:533. Moro, M., M. Pelagi, G. Fulci, G. Paganelli, P. Dellabona, G. Casorati, A. G. Siccardi, A. Corti. 1997. Tumor cell targeting with antibody-avidin complexes and biotinylated tumor necrosis factor α. Cancer Res. 57:1922. Corti, A., A. Gasparri, A. Sacchi, F. Curnis, R. Sangregorio, B. Colombo, A. G. Siccardi, F. Magni. 1998. Tumor targeting with biotinylated tumor necrosis factor α: structure-activity relationships and mechanism of action on avidin pretargeted tumor cells. Cancer Res. 58:3866. Winzler, C., P. Rovere, M. Rescigno, F. Granucci, G. Penna, L. Adorini, V. S. Zimmermann, J. Davoust, P. Ricciardi-Castagnoli. 1997. Maturation stages of mouse dendritic cells in growth factor-dependent long-term cultures. J. Exp. Med. 185:317. Rovere, P., V. S. Zimmermann, F. Forquet, D. Demandolx, J. Trucy, P. Ricciardi-Castagnoli, J. Davoust. 1998. Dendritic cell maturation and antigen presentation in the absence of invariant chain. Proc. Natl. Acad. Sci. USA 95:1067. Chionna, A., E. Panzarini, P. Pagliara, A. De Luca, S. Caforio, L. Abbro, L. Dini. 2003. Hepatic clearance of apoptotic lymphocytes: simply removal of waste cells?. Eur. J. Histochem. 47:97. Bonanno, E., G. Tagliafierro, E. C. Carla, M. R. Montinari, P. Pagliara, G. Mascetti, L. G. Spagnoli, L. Dini. 2002. Synchronized onset of nuclear and cell surface modifications in U937 cells during apoptosis. Eur. J. Histochem. 46:61. Corti, A., G. Fassina, F. Marcucci, E. Barbanti, G. Cassani. 1992. Oligomeric tumor necrosis factor α slowly converts into inactive forms at bioactive levels. Biochem. J. 284:905. Rovere, P., M. G. Sabbadini, C. Vallinoto, U. Fascio, M. Rescigno, M. Crosti, P. Ricciardi Castagnoli, G. Balestrieri, A. Tincani, A. A. Manfredi. 1999. Dendritic cell presentation of antigens from apoptotic cells in a pro-inflammatory context: role of opsonizing anti-β2 glycoprotein I antibodies. Arthritis Rheum. 42:1412. Castiglioni, P., A. Martin-Fontecha, G. Milan, V. Tomajer, F. Magni, J. Michaelsson, C. Rugarli, A. Rosato, M. Bellone. 2002. Apoptosis-dependent subversion of the T-lymphocyte epitope hierarchy in lymphoma cells. Cancer Res. 62:1116. Voll, R. E., M. Herrmann, E. A. Roth, C. Stach, J. R. Kalden, I. Girkontaite. 1997. Immunosuppressive effects of apoptotic cells. Nature 390:350. Talmadge, J. E., H. Phillips, M. Schneider, T. Rowe, R. Pennington, O. Bowersox, B. Lenz. 1988. Immunomodulatory properties of recombinant murine and human tumor necrosis factor. Cancer Res. 48:544. Li, M., G. M. Davey, R. M. Sutherland, C. Kurts, A. M. Lew, C. Hirst, F. R. Carbone, W. R. Heath. 2001. Cell-associated ovalbumin is cross-presented much more efficiently than soluble ovalbumin in vivo. J. Immunol. 166:6099. Gasparri, A., M. Moro, F. Curnis, A. Sacchi, S. Pagano, F. Veglia, G. Casorati, A. G. Siccardi, P. Dellabona, A. Corti. 1999. Tumor pretargeting with avidin improves the therapeutic index of biotinylated tumor necrosis factor α in mouse models. Cancer Res. 59:2917. Guttinger, M., F. Guidi, M. Chinol, E. Reali, F. Veglia, G. Viale, G. Paganelli, A. Corti, A. G. Siccardi. 2000. Adoptive immunotherapy by avidin-driven cytotoxic T lymphocyte-tumor bridging. Cancer Res. 60:4211. Aderem, A., D. M. Underhill. 1999. Mechanisms of phagocytosis in macrophages. Annu. Rev. Immunol. 17:593. Bondanza, A., P. Rovere, A. Borri, E. R. Caremoli, A. Guidetti, G. Citterio, G. Consogno, V. S. Zimmermann, C. Rugarli, A. A. Manfredi. 2001. Cytokine secretion associated with the clearance of apoptotic bodies in renal cell carcinoma patients. Int. J. Cancer 91:713. Stuart, L. M., M. Lucas, C. Simpson, J. Lamb, J. Savill, A. Lacy-Hulbert. 2002. Inhibitory effects of apoptotic cell ingestion upon endotoxin-driven myeloid dendritic cell maturation. J. Immunol. 168:1627. Vrouenraets, B. C., J. M. Klaase, O. E. Nieweg, B. B. Kroon. 1998. Toxicity and morbidity of isolated limb perfusion. Semin. Surg. Oncol. 14:224. Tong, Y., W. Song, R. G. Crystal. 2001. Combined intratumoral injection of bone marrow-derived dendritic cells and systemic chemotherapy to treat pre-existing murine tumors. Cancer Res. 61:7530.